Basal cell carcinoma is also called basalioma. It is the most common type of skin cancer that is usually due to sun exposure. Basal cell carcinoma rarely spreads to other organs, unlike other skin cancers. Nevertheless it is still important to get it treated. Almost everyone who gets treatment are cured from the disease. The risk of basal cell cancer is small before 40 years of age, but increases when you get older. The most common symptom is a new knot like resistance, a redness stain or a wound that does not want to heal. Usually the change is in the face or upper chest or back. 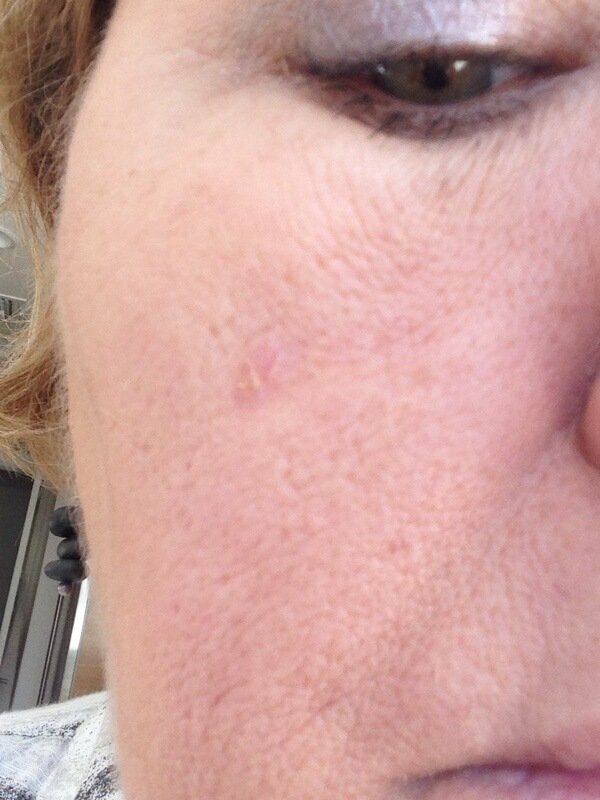 Basal cell carcinoma grows very slowly.  Over time, wounds often occur that heal periodically and you can therefore think that the problem is over. Symptoms may have causes other than cancer. Here you can find out more about benign skin changes. There are also other types of skin cancer, such as squamous cell carcinoma and malignant melanoma. There are different types of basal cell carcinoma. They differ by the way they grow in the skin, the appearance and how deep down in the skin the cancer is. Superficial, or superficiell, basal cell cancer looks like a red stain. Sometimes there can be cuts and scaly like. It can be misinterpreted as a small eczema patch. It usually on your chest or back, but it can also be on your face. Knot formed, or nodular, basal cell cancer grows deeper into the skin. It is a clearly defined knot. It can be the same color as your own skin or be pale red and slightly translucent with small red blood vessels. Eventually a raised edge is formed. Sometimes, ulcers and crusts appear on the cancer tumor. It usually sits on the face or on the neck, but can also sit on the upper body. Aggressive, infiltrative or morfeiform basal cell carcinoma grows in a deeper, more diffuse way. It may look like a hard, whiteish, scar like, flat changes in the skin. Sometimes it is difficult to see the cancer and to determine how big it is by only looking at it with the naked eye. One or more wounds can appear when in it grows. It is common for the cancer tumor to sit on the face, around the nose or around the eyes. Thank you for sending your case. Based on the information and images, the option of superficially spreading BASAL CELL CANCER must be ruled out: Basal cell cancer is a very common skin tumor caused by excessive sun exposure. Fortunately, this type of skin cancer only grows in the skin and does not spread to other organs. Nevertheless, other diagnoses can also be considered. I recommend that you see a dermatologist in order to confirm the diagnosis and discuss the most appropriate treatment option in your particular case. A biopsy may be necessary prior to treatment. I am a 45 year old male. It was Brown for over a year in the last few weeks it has become crusty and today a scab came off and it has bled. It does not look like it will heal. There is a scab forming. Based on the information and images submitted of your back, the option of BASAL CELL CANCER, the less malignant form of skin cancer caused by excessive sun exposure must be ruled out. Fortunately, it only affects the skin and does not spread to other organs. 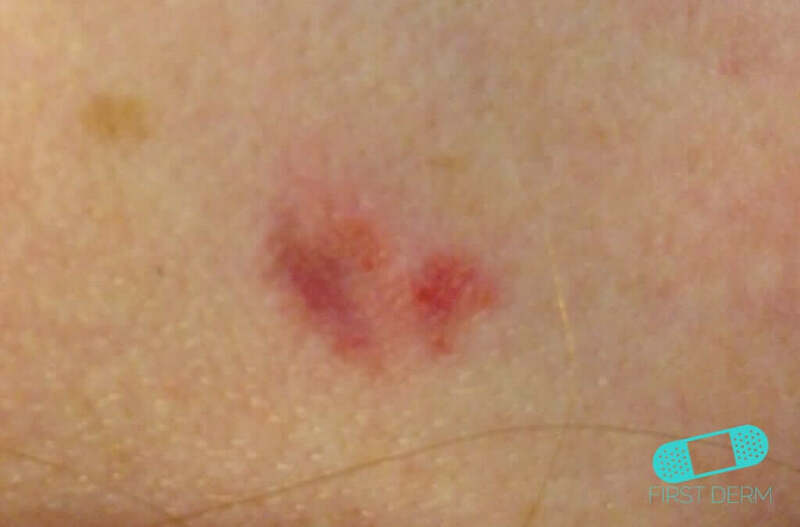 These lesions can be cured with surgery and other methods such as creams containing Imiqvimod that is an immunomodulator that stimulates your own immune system to reject it. I recommend that you see a dermatologist in order to discuss the most appropriate option in your particular case. A biopsy may be necessary prior to treatment. I am a 53 years old female. Healthy, no smoker. I have been in the sun since I live in Miami. I have had this for some months. The patch is on my left side of the face and has been forming a crusty appearance with mild blood vessels. It is now periodically bleeding and can be very itchy. Thank you for sending your case of your face. 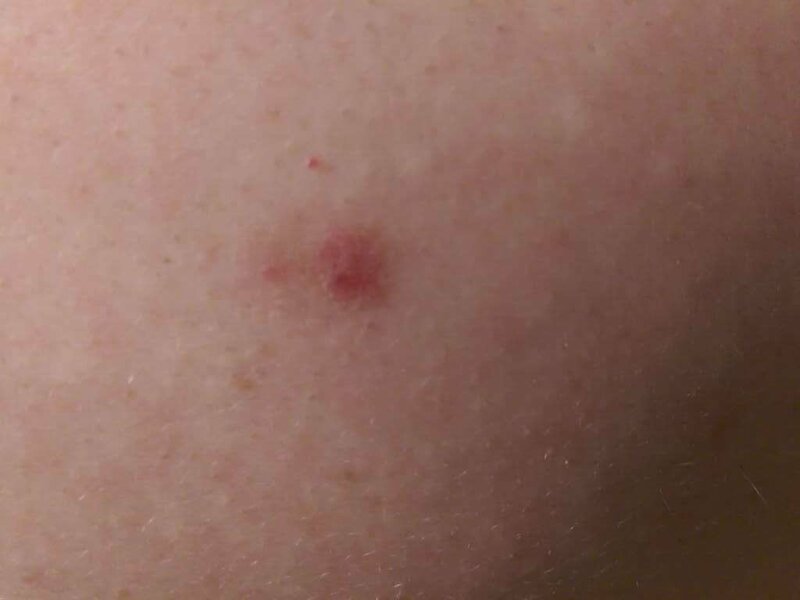 This is possibly BASAL CELL CANCER, a very common skin tumor caused by excessive sun exposure. Fortunately, this type of skin cancer only grows in the skin and does not spread to other organs. Of course, other diagnoses can also be considered including benign growths. I recommend that you see a dermatologist in order to confirm the diagnosis and discuss the most appropriate treatment option in your particular case. A biopsy may be necessary prior to treatment. I am a 26 years old woman and I have had this spot on my arm for months. 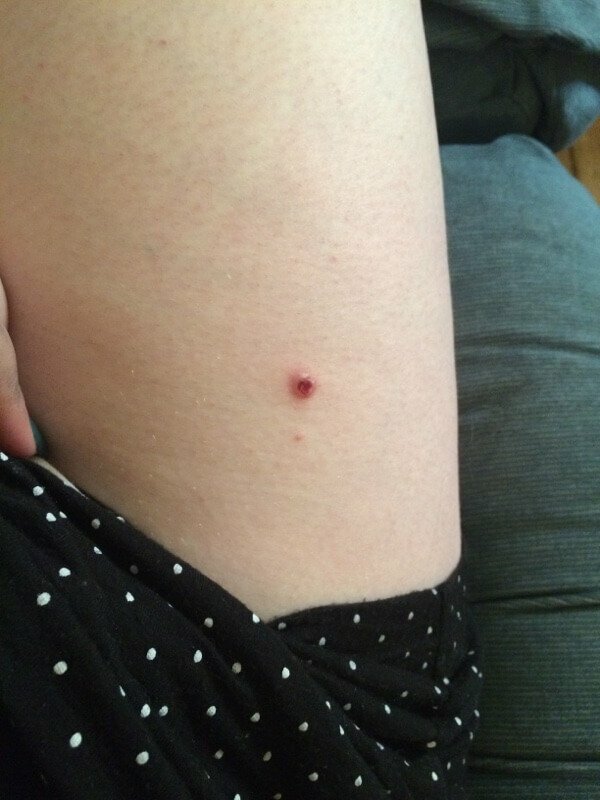 It is a painless scab I have had on my upper thigh for months. It is not healing and I have tried to use neosporin, black salve and nothing will take it away. It is hard there is no puss. I sunbathe and take sun tanning beds quite often during the winter. 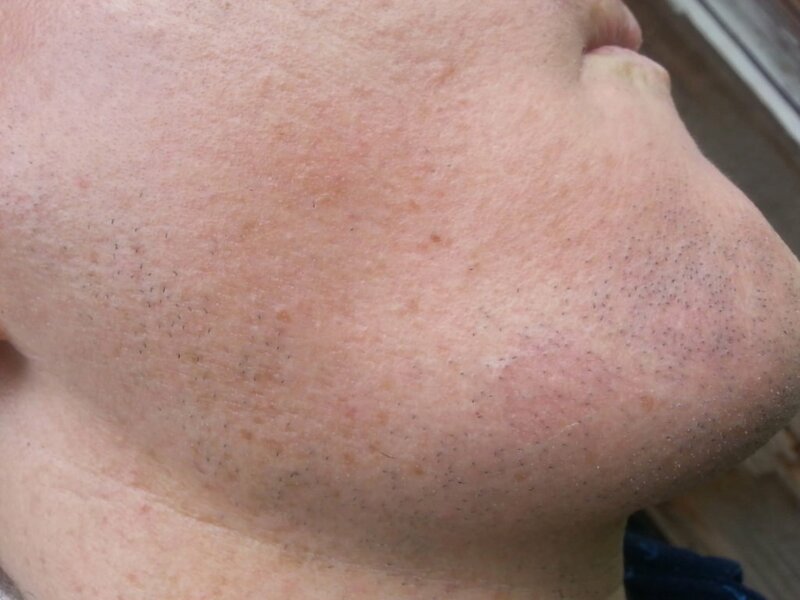 Possibly BASAL CELL CANCER, a skin tumor caused by excessive sun exposure. However, other diagnoses may be considered including a benign cyst, an ingrown hair or other tumor of the skin. If it is a basal cell cancer, these fortunately only grow in the skin and do not spread to other organs. It can be cured with surgery. I recommend that you see a dermatologist in person for examination with a dermoscope (a specialized magnifying glass. A biopsy may be needed to confirm the diagnosis.